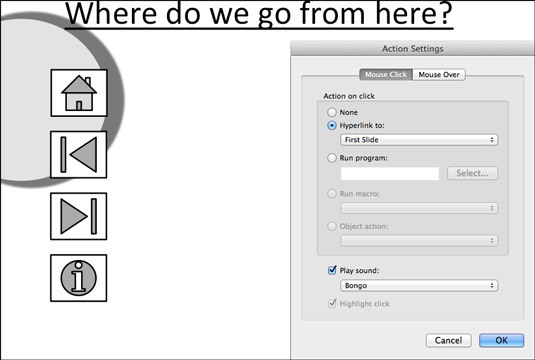 A user‐run, or interactive, PowerPoint presentation is one that you create on your Mac where the viewer gets to control. The viewer decides which slide appears next and how long each slide remains onscreen. User‐run presentations are similar to websites. Users can browse from slide to slide at their own speed. They can pick and choose what they want to investigate. They can backtrack and view slides that they saw previously or return to the first slide and start anew. Another way to help users get from slide to slide is to create action buttons. An action button is a button that you can click to go to another slide in your presentation or the previous slide you viewed, whatever that slide was. PowerPoint provides 12 action buttons on the Shapes gallery. On the Home tab, click the Insert Shapes button. A submenu of action buttons appears. Click an action button to select it. Choose the button that best illustrates which slide will appear when the button is clicked. Draw the button on the slide. To do so, drag the pointer in a diagonal fashion. (As far as drawing them is concerned, action buttons work the same as all other shapes and other objects.) The Action Settings dialog box appears after you finish drawing your button. Go to the Mouse Over tab if you want users to activate the button by moving the mouse pointer over it, not clicking it. Select the Hyperlink To option button. On the Hyperlink To drop‐down list, choose an action for the button. For example, choose the next slide, the previous slide, the first or last slide in a presentation, the last slide you viewed, or a specific slide. To make clicking the action button take users to a specific slide, choose Slide on the list. You see the Hyperlink to Slide dialog box, which lists each slide in your presentation. Select a slide and click OK.
To play a sound when your action button is activated, select the Play Sound check box and select a sound on the drop‐down list. “Mouse‐over” hyperlinks, which are activated without the user’s having to click them, work better with sound accompaniment because they help users understand when they’ve activated an action button. Click OK in the Actions Settings dialog box. To test your button, you can right‐click it and choose Hyperlink→Open Hyperlink. Select the Browsed by an Individual (Window) option button. Your presentation is no longer quite yours. It also belongs to all the people who view it in your absence.